MUFON member receives photo, report of anomaly over Grovetown, Georgia. Two weeks ago, a resident of Grovetown, Georgia took a brief look skyward during a Friday night football game between the Grovetown Warriors and the Lincoln County Red Devils. What he saw in the sky that night immediately arrested his attention. Moving west to east at a slow rate of speed was a wedge-shaped object – its triangular light configuration clearly visible from the stands. The witness (who wants to remain anonymous) first tried to use his cell phone to record the aberration. When his phone malfunctioned, he borrowed the phone of a friend who had joined him for the game that evening. 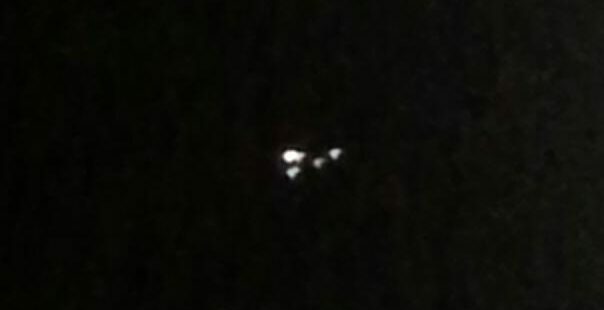 The witness later texted the picture to Donnie Brooke, a member of the Georgia Chapter of MUFON (Mutual UFO Network). MUFON is the world’s oldest and largest UFO phenomenon investigative body. Brooke said the witness told him over the phone that he had leaned back in his seat, looked skyward, saw a “humongous” object and thought, “That doesn’t look right.” After taking the picture and asking his friend to forward it to him, the witness ascertained that the UFO was moving eastward toward Fort Gordon Army Base. 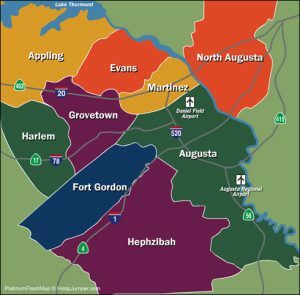 The base (which is located just a few miles southwest of Augusta, Georgia) sits less than nine miles away from Grovetown High School. Brooke said it would be impossible to make a direct connection between the Grovetown sighting and the army base, but noted that Fort Gordon is home to the U.S. Army Cyber Center of Excellence. Maryland readers may recall that, in 2013, Fort Gordon won out over Fort Meade in a bid to become the location of the futuristic United States Army Cyber Command. As the Cyber Command center, Fort Gordon hosts intelligence personnel from all service branches, as well as civilians from the National Security Agency (NSA). 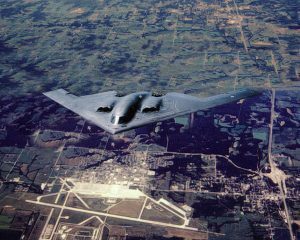 A Northrop-Grumman B-2 “Stealth” bomber over Whiteman Air Force Base, Missouri. Grovetown Department of Public Safety official Mr. Haynes told the Baltimore Post-Examiner he could find “nothing in the system” related to calls about strange lights in the sky around the night of September 1, 2017. Likewise, a quick search of reported sightings in Georgia to the National UFO Reporting Center yielded nothing from the night of September 1. However, another witness reported seeing a “diamond shaped” object in the sky over Lindale, Georgia just two days later. One fascinating report does appear on September 1 in the Georgia MUFON database, but that describes an August 22 sighting near Rinngold, Georgia. When asked if it was possible that the witness saw a B-2 Stealth bomber, Brooke said he didn’t believe that was the case. Brooke urges anyone else in the Grovetown/Augusta area, who saw the object Brooke’s witness reported that night, to get in touch with the Georgia chapter of MUFON. A somewhat similar UFO sighting near Augusta in October, 2015, was later confirmed by MUFON to be a formation of RV-8 light aircraft in preparation for a performance at the Boshears Skyfest. For more information about the work of MUFON, please read our interview with UFO investigator Norm Gagnon. Those in the Maryland area who interested in learning more about UFO’s are also encouraged to attend the upcoming Mysteries of Space and Sky Conference. I believe it was a part of Project Solar Warden. I believr it was a TR3A or TR3B. Built from back engineered alien technology from the 4 UFO crashes in the 1940’s. If you can e-mail me, I can send you some info on Project Solar Warden. E-mail me at: donniebrooke@mail.com. Donnie Brooke – Pro Wrestler / UFO Hunter. It was a C-17,probably. The observer said it was heading toward Fort Gordon. 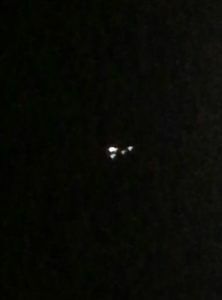 I live near a base,and see them nearly every night. They can look strange and slow moving,but that’s because they’re so big.And they have triangular lights.Just my opinion,though.